During the summer season, individuals along with their friends and families love to head outside and engage in various activities. This can range from picnics to spending the day at the beach. No matter the type of activity you would like to do with your loved ones, it is important to have the right gear and equipment that can help you be comfortable when staying outdoors. Whether you are in a picnic area or at the beach, one of the best ways that you can have fun yet be comfortable at the same time is by having a folding beach chair that you can sit on. You won’t have to worry about getting your pants muddy or having to sit on the sand all day long when you have one of these that you can easily bring with you anywhere. In this article, we are going to look at the features of the ONIVA Picnic Time Low Profile Portable Folding Beach Chair from the Vibe Collection to see if this brand and model will suit you and your needs for this summer. If you are looking for a beach chair that you can use for the beach and all your other outdoor activities, the ONIVA Picnic Time Portable Folding Beach Chair from the Vibe Collection is a great option for you, your friends, and your family. This beach chair is heavy duty and durable since it has a body frame that is made of silver powder coated steel. This makes this chair able to last long even when regularly used outdoors. The seat materials are made with polyester which is easy to clean and can withstand various weather conditions. Furthermore, if you are going to use this on the beach, the polyester material dries quickly in case it accidentally gets wet. This beach chair also comes with padded armed rests for added comfort and a large zippered pocket on the back edge of the headrest where you can secure items like your cell phone and other gadgets. This beach chair promotes better portability and easy use with its inward-folding design. You can easily expand and fold this beach chair without hassle whenever you need to use it. The drawstring carrying bag with shoulder strap lets you carry it around with you wherever you need to go, as well as a secure container for better storage when not in use. The ONIVA Picnic Time Portable Folding Beach Chair from the Vibe Collection is a must have for people who love to head to the beach during the summer or even go to various outdoor places for some fun time and activities. It is portable, compact, and easy to carry around so you don’t have to worry about it becoming a hassle to carry around with you on your trips. This beach chair is made with silver powder coated steel which makes it durable, sturdy, and strong. It has the capacity of carrying weight up to 225 pounds so you don’t have to worry about falling over this chair or having it collapse under you. 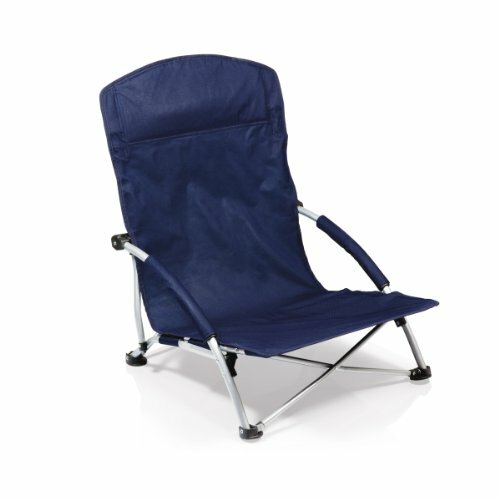 The King Camp Low Sling Beach Camping Folding Chair with Mesh Back features a low seating and has a heavy duty steel frame. It also has foamed armrests, a cup holder and comes with a carry bag for easy portability. The mesh back of the seating material promotes breathability and comfortability which you need during hot summer days. The Funs Portable Low Sling Folding Chair is also made with steel framing to promote durability and sturdiness. It folds easily for better portability and comes with a storage bag where you can keep it. The seating of this foldable beach chair is made with heavy-duty Oxford fabric and has padded armrests. The ONIVA Picnic Time Portable Folding Beach Chair from the Vibe Collection is great for individuals and families who love to spend their days at the beach or doing outdoor activities. This beach chair is heavy duty since it has a frame that is made with silver coated powder steel. It has a sitting capacity of up to 225 pounds so you do not have to worry about falling over when seated on this chair. It features an inward folding design that lets you easily assemble and collapse this chair so you can use it anytime you want without hassle. After every use, you can simply collapse this beach chair in seconds. Since this beach chair comes with a drawstring carrying bag, you can easily carry it around with you anywhere. This also lets you store it easily whenever you are not using it. With a zippered security pocket located on the back of the head rest, you can place your valuables in it securely. The ONIVA Picnic Time Portable Folding Beach Chair from the Vibe Collection is a must have for people who love to spend their summer days outdoors.